During Millenniums short lifetime (Millennium retired 10 1/2 months after it was introduced on November 12, 1999) there were several variations, technically they were misspellings! In fact it took 5 tries to get Millennium spelled correctly on both the swing and the tush tag! There are also 2 different ribbons for Millennium! There were even fake Millennium Beanie's produced! 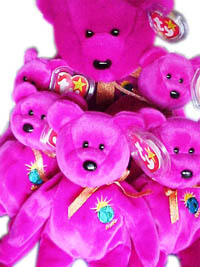 making it a once in a lifetime Beanie Baby! The back of the hang tag reads, "Ty Sales Conference Renaissance Hotel Dec 12-14, 1999." Each Buddy was presented in their very own box wrapped in tissue paper that was white with little read hearts! This is definitely the rarest Buddy ever! 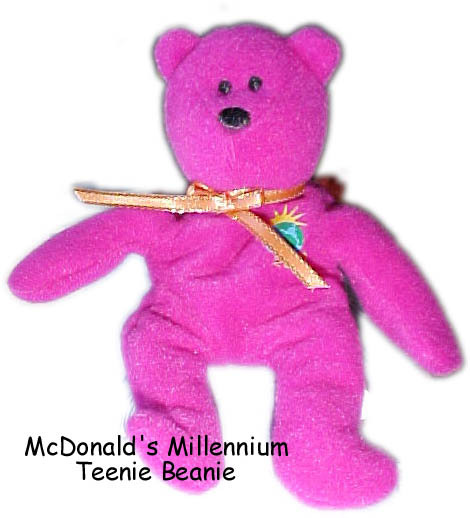 For the June 13, 2000 McDonald's McHappy Day , a Millennium Teenie Beanie was created and given away with a food purchase.These bears were of extremely limited quantity. An estimated $4 million was expected to be raised during this one day for the Ronald McDonald House Charities! Each Beanie came with a certificate of authenticity signed by SCF Managing Director Lea Perrell. 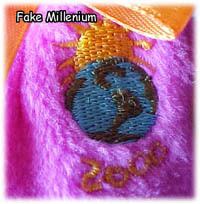 There were 20,000 of these Millenniums created. Do remember that this was NOT a Ty Produced Variation, Ty did not create the special hang tag. 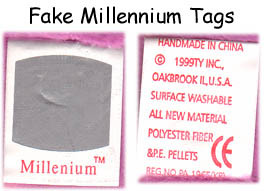 There are 5 different Millennium variations during to the word "Millennium" being spelled wrong either on the Swing tag or on the Tush tag! Incorrect spelling on both swing tag and looped hologram tush tag. It's misspelled "Millenium." 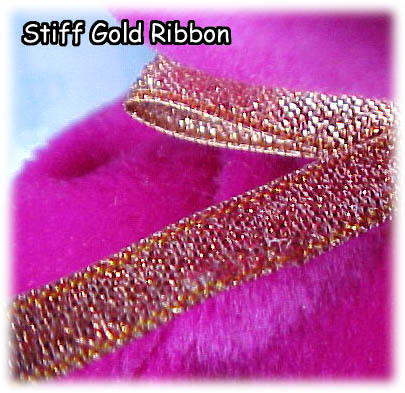 This version has the stiff gold ribbon. See below for ribbon differences! Also Gosport was misspelled as 'Gasport'. 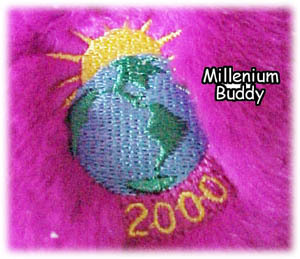 Incorrect spelling on swing tag but correct spelling of "Millennium" on the looped hologram tush tag. 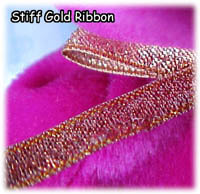 This version also has the stiff gold ribbon. Also Gosport was misspelled as 'Gasport'. Correct spelling on both swing tag and the looped hologram tush tag. This version also has the stiff gold ribbon. Correct spelling on both swing tag and the looped hologram tush tag. 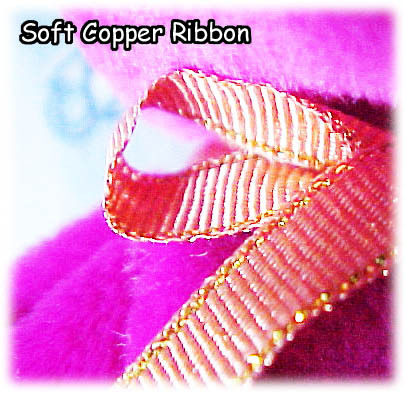 This version has the softer copper ribbon. Correct spelling on both swing tag and single non looped hologram tush tag. This version has the softer copper ribbon. 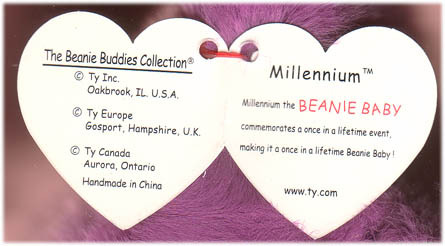 Yes someone created a counterfeit Millennium Beanie Baby! This Beanies hang tag looks pretty real and matches the other, however there are several things wrong with this beanie! The most noticeable is the tush tag! Ty makes the tush tags holograms for a reason! Because they are hard to counterfeit! That is what gives this Beanie away! 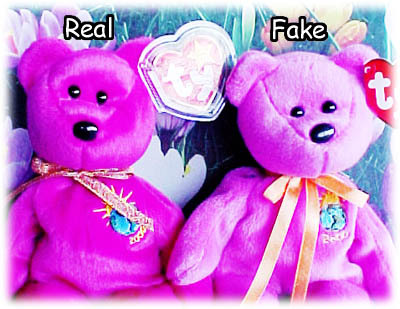 The tag doesn't have a real hologram, instead it has a gray area that sorta looks like the same image seen in the hologram of the real version.